Forty-five pupils and seven teachers travelled from Our Lady’s Secondary School Templemore to Munich for 5 days during the October break. 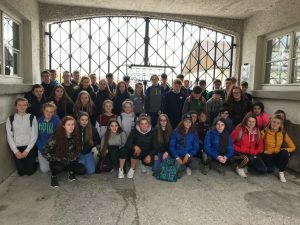 When we arrived we travelled to Dachau and visited the Dachau Concentration Camp Memorial Site where we got a guided tour and it was a very poignant and enlightening visit. From there we went to the Hofbrauhaus in Munich, which is an infamous Beerhall. On the second day, we went to the Allianz Arena which is FC Bayern Munich’s home grounds. It was a magnificent stadium and everyone thoroughly enjoyed it. We then visited the Marienplatz which is the central square in Munich. We then finished our night by going up the Olympic Tower to experience a beautiful view of the city at night. On the third day, we travelled to the BMW Museum which was full of many fascinating cars. Afterwards we went to the Munich Documentation Centre where we had a very interesting tour on World War II. That evening we had great fun at a Bowling Alley in Munich. The following day, we had a long trip to Austria where we visited the Obersalzburg Bunkers that Hitler used in World War II and the Berchtesgaden Salt Mines. This was the highlight of the trip, travelling down the slides at speed, to the lovely sound of Austrian music. On our final day, we travelled to the Zugspitze Mountain which is the highest point of the German Alps, 2962m. We travelled to the top by train through the mountains and a cable car. We had our final meal in a Gaststube in the beautiful town of Garmischpartenkirche. An experience of a lifetime! Es war eine wunderbare Erfahrung!